Mobile storage is the future of the storage industry. Although it’s relatively new, the mobile storage model is already growing faster than the traditional self storage model, and it’s easy to see why. Many consumers see mobile storage as a more convenient and more attractive solution compared to the alternatives. As consumer awareness increases, so does the demand for quality mobile storage options. If you were already thinking about getting into the storage business, the mobile storage business model could be your smartest decision yet. Let’s take a step back. When a customer rents from a traditional self storage company, they have to rent a moving truck, load the truck, drive to the storage facility and unload the contents of the truck into the storage unit. This is not only a lot of work for the customer, but it takes up a large chunk of their day. It’s also not ideal for the self storage owner/operator as the potential customer base is roughly limited to a five-mile radius around the facility. With mobile storage, a portable storage container is delivered to the customer’s home—potentially from a great distance away–where the customer then loads the unit for return to the mobile storage facility. For customers, it’s a one-step storage solution offering unmatched convenience. Why Should I Consider Starting a Storage Rental Business? According to Inside Self Storage, a traditional self storage facility typically serves customers within a five-mile radius., Compare this to a mobile storage business model, which can serve customers up to a 100-mile radius. If a mobile storage business is located in an area where the housing market is already booming, the potential customer base becomes that much larger. A major perk of a portable lift system is the ability to tap into the long-distance mover market. If a mobile storage customer wants to move long-distance, their storage unit can move with them. A customer moving long distance with the intent of utilizing a storage unit at their new location, can simply have their items shipped with them in a mobile storage container. This is also a solution for a college student moving home for the summer. They can simply pack their items into their mobile storage container and have it moved back home with them for storage during break. 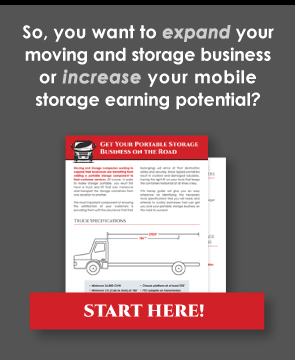 Are you interested in starting your own mobile storage business? In the next installment of our Mobile Storage Series, we’ll tell you exactly what you’ll need to do to start a mobile storage business, as well as some of the equipment you will need. Want your mobile storage questions answered before part two of the series? Contact us! Our representatives are ready to answer any questions you may have.